Kitten season is here. If you’re thinking of adding a kitten to your family, or if you already have one at home, make sure to teach appropriate playing techniques right from the start. Although your new kitten is young and cute, the rules of appropriate play should always be enforced. The things you allow your kitten to get away with now because they’re so adorable, may not be as adorable when he or she becomes an adult. If your kitten is becoming overly aggressive and biting or scratching you, it is important to stop this behavior as soon as possible. In order to prevent this, never use your hands or feet as playthings for your kitty to bite on, but rather use appropriate toys. All toys should be a distance from your hands so your kitten has no opportunity to bite or scratch you even by accident. Balls or stuffed mice that you can throw are good choices as are long poles with feathers on the end. A good toy is one that your kitten can wrestle with, like a soft stuffed toy that’s about the size of your kitten, so she can grab it with both front feet, bite it, and kick it with her back feet. 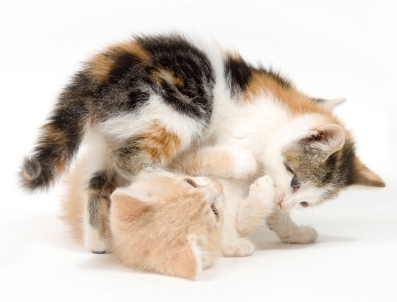 Encourage play with a “wrestling toy” by rubbing it against your kitten’s belly when she wants to play roughly; be sure to get your hand out of the way as soon as she accepts the toy. If your kitten bites or scratches you during play, say “Ouch!” loudly, stop playing, and walk away. It’s most effective to stop playing immediately when your kitten bites or scratches in order to convince your kitten that his behavior is not acceptable. If necessary, lock your kitten in another room so he knows that play time is over and withdrawal your attention. After a minute or two, call the kitten over and resume playing. Give lots of treats when your kitten is playing nicely. Continue to reward good behavior and stop the play whenever your kitten is too rough. If your kitten frequently jumps out and attacks you, put a bell on his collar so you can hear him coming and try deterring the attack with a squirt of water. You may have to confine or deny your kitten access to certain places for a while if he always launches attacks from a specific place. To encourage your kitten to pounce on something acceptable, drag a toy along the floor to give him even more exercise chasing the toy down. Remember that it is a natural instinct for kittens to play attack and they would normally do this with prey or practice on their litter mates. If you have no other cats in the household, you may want to consider adopting a second cat or kitten as a friend to your kitty. Having two cats not only keeps your cats happy but it also minimizes play-aggression toward humans. Your cat will be happy to have another cat to pounce on and play with while you are at work. Play with your kitten at least 10-15 minutes twice a day. Cats are often most active in the early morning and early evening. Exercise and vigorous playing can help get rid of excess energy and keep your kitten calmer for the remainder of the day. If you only have time to play once a day, choose night as your play time. It’s important to let your kitty get his energy out and if you do this before bedtime, your kitten will most likely become tired after play. If you are playing with a feather on the end of a pole, be sure to act as if the toy “died” when you want the play to end. Let your kitty pounce on it as you slowly bring the feather toy to a stand still. This way your kitten will think the toy is dead and will continue on without being too riled up. Never use physical punishment on a cat. Cats do not link the punishment with their bad behavior and they will only become fearful of you and other humans. Squirt bottles with water or noise deterrents like a hiss sound or an air canister can be very effective but only if used within the first few seconds of the unwanted behavior to startle the cat and not scare it badly. You never want to use these techniques if you have an overly fearful kitty. If neither of these methods work, give your kitten a “time out” in another room where you can distance yourself and show your kitten that play time stops when certain actions occur. This method is much more successful (and more humane) than any kind of physical punishment. Always be consistent about what type of behavior is allowable.